On Thursday, May 19, 2011, I had to get up very early to go to a business event in downtown Baltimore - had to be there by about 6:45 to set up. I walked out of the house and to my car and upon getting in, noticed that the car had been rummaged through. Papers were scattered about from the glove box, loose change on the floor, compartment in the dash was opened and emptied of the broken watch and bluetooth headset that had been in there. It's a petty crime and one that happens a little too frequently in our Mt. Washington neighborhood for my comfort level, but so it goes. I reacted as most people would in such a situation, by releasing a stream of under-my-breath expletives about as loud as I would permit myself while standing outside before 7 a.m. At the same time as I was stomping around, my very kind, neighborly neighbor Marianne was driving by on her way to work and slowed to ask what happened. At that particular moment, I thought I had just lost a few things in my car and I was trying to remember what was even in the car to be taken. I just grumbled to her about my car being broken into and losing a few things including, I thought at the time, a tripod that I needed for a video shoot that day. But, alas, the tripod I soon found in the trunk, along with a few other items that I thought were worthy of stealing. I figured they didn't bother or couldn't figure out how to pop the trunk ... so I considered myself a bit lucky and just got into the car and drove off. Fast forward to about 8 a.m. and my cell phone rings. I'm with the client and quickly turn it off without looking at the screen. A half hour later I check the message and it's from my wife Jennifer who says simply, "Hey, hon, uh, where's the Volvo?" And then it hits me. I didn't even notice ... when I drove off in in the early morning in my car, my wife's car wasn't there. We have been through this before. Back in 2007, my then 6-month old Mazda sedan was poached from in front of our house. That time, I ran into the thief while he was running errands at the Home Depot at the Reisterstown Rd. plaza. Truly. [One comical side note to that whole story, by the way, was in telling my brother Ken that I ran into my car thief with my car at the Reisterstown Rd. plaza Home Depot, the first thing he said was, incredulously, "you go to the Home Depot at the Reisterstown Rd plaza?"] Not anymore. Anyway, back to my current source of frustration with city living ... the missing 2001 Volvo V70 wagon, the one with 140k miles, our kid hauler, filled with toys and children's books and two carseats. Now in the hands of someone likely on a joyride, who went scrounging for loose change, ipods and GPS's in the middle of the night and hit the dirtbag jackpot. And let me just go on a rant for a moment here about crime. We all have watched tons of movies and shows where slick thieves are portrayed as cool as they rip off unsuspecting dopes. When you are the person whose stuff a criminal takes, the only feeling you have for them is rage. They took our car. With our kids' stuff in it. It's maddening. But then, you know, you calm down. It's just a car, a thing, you tell yourself and each other. Hell, it had a lot miles on it and we were shopping for something new anyway. The kids got an unexpected day off from school and by 3 p.m. we had a loaner Jetta and new car seats. A thing comes into your life and it goes away. It's a utility, you tell yourself, don't get too worked up about it, insurance will cover it. But still. It stings. Now allow me to digress from that digression for a moment about the disinterest of the Baltimore police department in this particular crime. Jennifer and I weren't expecting Bunk and McNulty to bring down the criminals with an elaborate undercover operation, but what the police did do in response was just north of nothing. A responding officer came out that morning to file a report. We learned the last time that what usually happens in these instances is that the thief is not an arch criminal with a network of comrades in Europe selling used parts to the mob ... no, it's typically a teenager on joy ride who is going to leave the car wherever it stops when it runs out of gas. Then someone will report that a car has been abandoned on their lawn or in the middle of the street and then Baltimore's finest will impound it and give you a call. Our car was stolen in the overnight hours of May 19th. A week and a half later, Jennifer got a call from the insurance company saying that they were having trouble processing our claim because the car was not officially reported as stolen and in the police database. Jen called the officer who filed the report to find out what was up - the officer made a few calls and found out that due to "dispatcher error," the car was never reported as stolen. So, in the time from when it was stolen, not only was no one looking for it (as if) but there wouldn't even be a reason for a police officer to call in something suspicious if they saw the car or even pulled over the driver. Unless, of course, the driver posted a sign that said "stolen car" in place of our tags. Two days after that call, they found our car. With the gas on E and the sunroof smashed in, the cops picked it up not far from Pimlico, less than 2 miles from our house. 1.) Failure to pay tickets. 2.) It's been in a hellacious accident and just gets hauled off there. 3.) Someone stole and abandoned it. 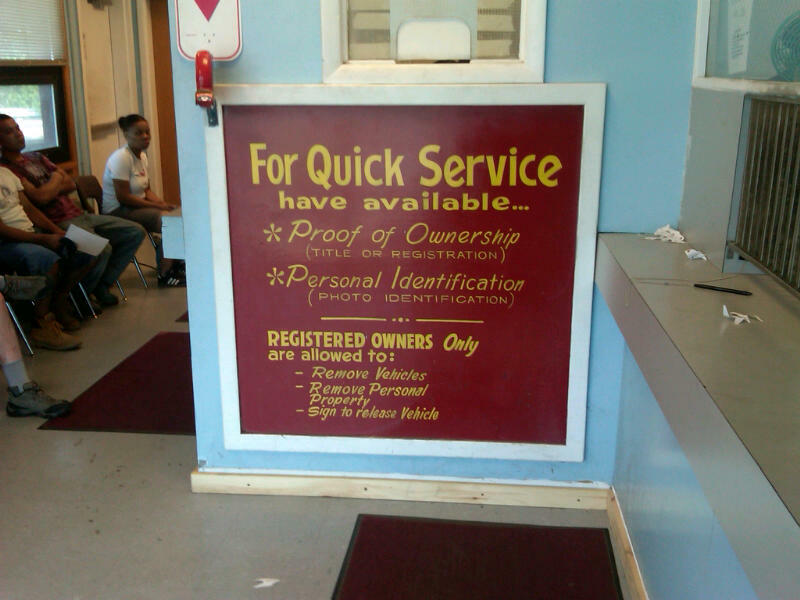 Baltimore city's impound lot is located on Pulaski Highway, which looks a lot like a place called Pulaski Highway, in an area dotted with strip clubs, auto body shops, adult book stores, and shady looking motels. It fits right in. The office is a large shed of a building, with attendants behind barred off windows, gas station style, separating faithful city employees from people who might not be super psyched that their vehicle has been placed in the parking lot of broken dreams. 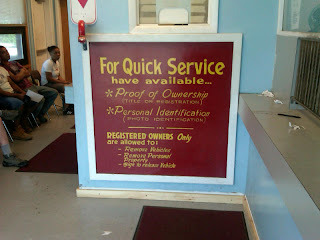 To get your car out, it costs $140 for the tow, $50 for storage and a $40 administrative fee. 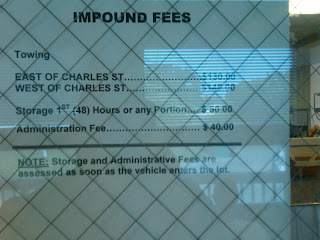 $230 is a figure we kept hearing people being charged for getting their car out. (Wonder why we haven't seen an impound lot Groupon yet...) You may use a credit card, but that carries with it a $12 fee because they consider it a cash advance and, you know, credit cards are such an exotic form of bill payment these days. In fairness, there is a MECU ATM in the corner near the cashier cages, just to the left of the nailed down plastic chairs. So what happens when you get there is you take a number from deli-counter style machine and they call you and you step right up to the counter. You give the worker your title and driver's license and tale of woe. Then you sit back down until your car model is called, and a guy who's seen it all takes you back, three or four at a time into a massive parking lot of broken down, discarded, and otherwise troubled vehicles. The lot is huge, and the cars populating it are not, generally in good shape. There's a caged off area of motorcycles and mini bikes. Because you go in groups, you get to see and hear the stories of the other people as you sit scrunched next to them in a crappy Chevy with a City of Baltimore logo on the side. Anyway, I was in there with an elderly woman who informed us that she was there to fetch the belongings from her brother's car - she said he walked away fine after passing out at the wheel and slamming into 2 parked cars. She had to unload the car, a Crown Victoria, of a bunch of his stuff. Anxious to get to my car, I got out to help and watched as she waded through his car, a few hats, a travel iron, grocery bags. She popped the trunk and found some corn that had turned a spoiled brown. Before getting back in the car, she stood there for a while with a hand on a hip, just looking at the mangled front end. There was a massive, V-shaped crater in the front grill and both airbags had been deployed and now hung limp - "mmmph, mmmph, mmmph," she said, "good thing for those airbags." Next up came a young woman who needed to pay a visit to her Chevy Blazer. She told the driver she couldn't afford to get it out right now, but needed her shoes and a bunch of other stuff. So I watched as she unloaded more pairs of shoes than you would hope that anyone you know stores in their car into a brown paper bag. Next up came my turn... it's kinda like an airport Super Shuttle for losers this ride I was on ... and I saw the nose of the Volvo peeking out from the row. Looked OK. Got up close and saw that the sunroof was smashed. But the body looked alright, no major dents. Got out of the impound limo and got in my car, pushing glass off the seat... turned the key and it started. Realized there were a bunch of clothes that weren't ours all over the place ... didn't drive the car out because I didn't want to drive it with all the glass and didn't know if it was OK to drive. So I had to go back to the shack and release the car to the insurance company, which later sent a tow truck and had it brought to our car repair place of choice. I felt happy to have the car back, still mad that it was stolen but overall a decent outcome considering the circumstances. As I write this we're still waiting for the adjuster to give us a damage total but I'm assuming we'll put it back on the road after a thorough cleaning. I'm thinking we are going to ask whoever details it to detail it after they detail it. When you're out at the impound lot, it's hard to take a long time with the car because you feel the eyes of the other auto sweepstakes losers waiting for you, as is the friendly driver. Finally when the Volvo was at the auto shop, I put on a pair of gloves and sorted through the stuff in it. Jen was happy that the kids "Bop It" toy was left behind, as was Alec's Thomas the Tank engine umbrella and sunglasses and their books and some action figures. Though I feel like I want to have those things washed or just toss em. I put em in bags. Then I looked at what the car thieves left in the car. Very weird. It was an assorted bunch of karate gear - several black belts and a robe that included the name of a karate place. As it turns out, the name of the place is for troubled youths... and, here we go, one of the blackbelts had a person's name on it. I'm not going to write that name here because I don't know if that person stole our car, is related to the person who stole our car, or had his stuff stolen by the person who stole our car. I'll let the police put their best team on that case. Then, the final kicker. Jen later visited the car and found the kids' Milkshake CD (kids songs) had been destroyed, and in the CD player was a homemade mix called "In the Guttah."